Now you can auto-generate trade areas by population size! More often than not, population requirements are one of the first items to check off of your list when identifying new locations. You know that to operate your business, you'll require X number of people to be present within a trade area. But figuring out how many locations you can do in that market, and what size trade area to use are less easily answered. For this reason, our new Market Planner feature is a game-changer for retailers and brokers alike. Now instead of employing a guess and check method to determine the size of a trade area capturing a specific population around a candidate site, you can get market planner to do the work for you. The feature is housed in our Target Market Panel and can immediately be applied to any of your layers. Market Planner is optimized by using Hex Bins, which are consistently shaped, rather than Block Groups/DAs. For many users, data aggregation by hex bins will be a new feature, and so we encourage you to check out this article to learn more. Market Planner can only be turned on at zoom level 13 or greater. This is the same zoom level requirement as hex bins. Market Planner can only be used on candidate layers. You can read more about candidate layers here. In order to use Market Planner, you first need to create a set of candidate sites. You can either upload your own candidate layer, or you can right-click on the map to create a new candidate (see below). A new dialogue box will pop-up asking you what layer you would like to save this candidate to. You can either select one of your existing candidate layer or create a new one. Once you have entered all of the candidate points you would like to draw trade areas for, you are ready to turn on the market planner feature. 1. Use the "Market Planner Layer" dropdown to select the desired candidate layer. 2. Enter a total population target for the trade area you would like to map around each candidate site and hit "Save". Below is a sample visualization of what you will see on the map. The dark red shading represents the outline of each trade area. The lighter red striped shading represents areas where your candidate trade areas are overlapping. Each of these trade areas represents your target population around the candidate site. The three hexbins with the thick blue outlines represent the greatest population density. 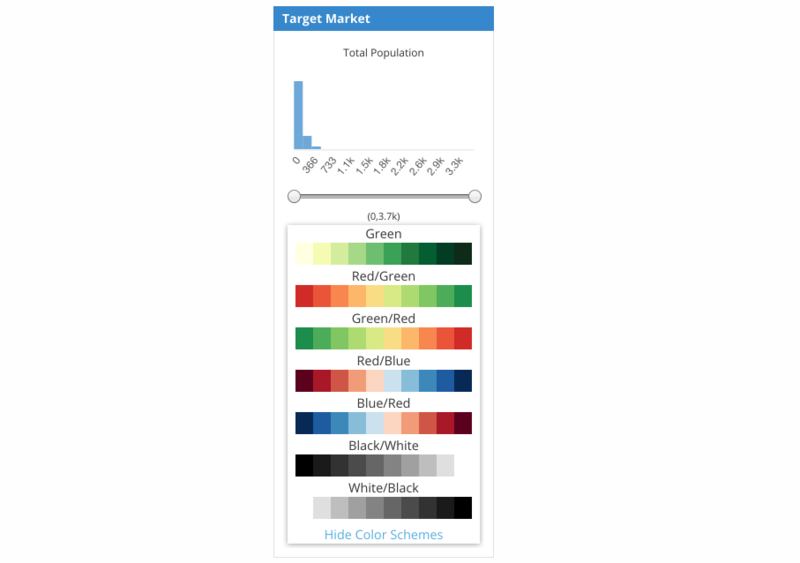 ✍️ NOTE: When Market Planner is turned on, the heatmap will only display variance in total population. The demographic popup you get when you click on a DA or block group will display all demographic selections. density on your map view. If you would like to save these trade area shapes and more easily visualize their boundaries on the map, return to the Target Market panel and click the large blue button that says, "Save Trade Area Shapes". You can click on any of the trade area shapes to bring up the same context menu you will see for other trade area types (rings, walktimes, drivetimes etc.). Now that you know the geographic area that represents your candidate trade areas, you can dig into all of the robust analysis built into the PiinPoint platform. Have additional questions about Market Planner? Don't hesitate to reach out to your Customer Success Manager or use the Chat to connect with our team.